Papaya fruit has a high fiber content. That is why when experiencing difficult defecate, papaya fruit is fit for consumption. Of course, savor not only on the papaya fruit only. You can also make a herbal ingredients to overcome the symptoms of worms in children aged 3 years and using the dried root of papaya mixed with garlic. The result is not lost with helminthic that are sold in many stores. Here are some herbal ingredient examples. Chew a teaspoon of raw papaya pits in the empty stomach every day can prevent and eradicate worms and other parasites. Papaya seeds can be used in wet or dry. If it seems too strong, can be mixed with dates or honey. You can blender the papaya seeds and mixed with a little water, and drink it. As the anti parasite program, eat papaya seeds of this every day for a week, then repeated two weeks later. Alternatively, take 10 grams of dried seeds powder of papaya. Boil this powder with 150 ml of water, up to 75 ml of solution obtained after filtering. This result can be drunk at the same time two hours before dinner. To make helminthic, use 10 grams of dried papaya root, 1 gram of garlic, and 100 ml of water. Chop up finely all materials, then boiled with water for 15 minutes, filter it. If necessary, add water so that 75 ml of distillate. 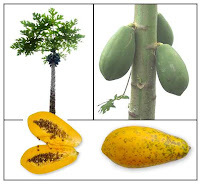 Now you can freed from wormy (hookworm and tapeworm) in a cheap and natural way using papaya. Good luck!